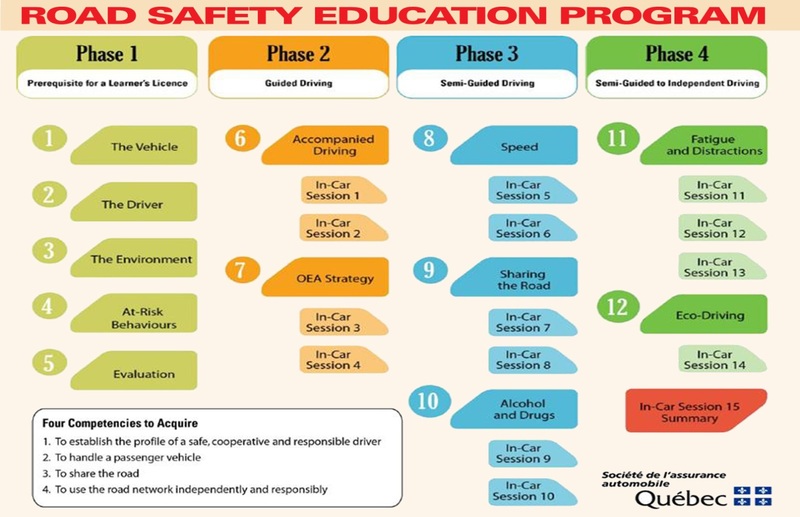 12 classroom theory modules each lasting two hours, work in team on an activity related to program competencies, presentation of knowledge content by the instructor on a variety of road safety topics. And 15 hours of practical in-car sessions each lasting 55 minutes including briefing and debriefing before and after the course; self-evaluation by learner for his or her strengths and improvement areas. The knowledge and skills acquired in class are gradually put into practice in the In-Car Sessions. Formative evaluation throughout the process provide a picture of the learner’s progress and shed light on his or her strengths and weaknesses. The learner is made aware of the significant roles played by speeding, alcohol, drugs, and fatigue in the occurrence and seriousness of crash. Toward the end of the program the learner is practicing independent driving where it places the learner drivers in situations in which they must make their own choices, in a way that leads to the right decisions and makes them feel responsible for their driving when they are alone behind the wheel. Students must have completed all 4 phases and pass school evaluation, in-car session 15 (summary session) to qualify to obtain the final certificate. This certificate will enable student to go through SAAQ road test. 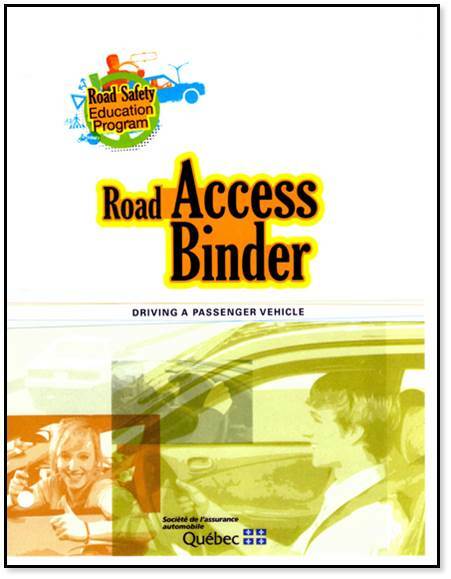 After successful completion of road test student will receive a two years probationary driver’s license. Every phase must be completed entirely (Theory and in-car sessions) before proceeding to next phase. Phase one must be completed in a minimum of 28 days comprises 5 theory modules. Modules are done once a week for 5 weeks. On the 5th module student must pass a multiple choice 30 question exam in the classroom. Upon successful completion of the exam, the student receives a certificate from the school in order to get his/her learner permit from SAAQ. At SAAQ service center student must complete medical declaration form and go through eye exam. Phase 2 must be completed in a minimum of 28 days, includes 2 theory modules and 4 hours of in-car sessions. In-car sessions 1 and 2 cannot be combined. Phase 3 must be completed in a minimum of 56 days, comprises 3 theory modules and 6 hours of in-car sessions. In-car sessions 5 and 10 are formative evaluation sessions. These evaluations will be done by school certified instructor and the student as well. Instructor and student both will review student strong and weak areas and highlight the areas that may require more practice. It is also possible to combine 2 in-car sessions into two 55 minutes sessions over the course of the same day (in-car sessions 5 and 10 cannot be combined). Phase 4 must be completed in a minimum of 56 days, comprises 2 theory modules and 5 hours of in-car sessions. Driving 12 and 13 are combined into a 2 hour session with 2 learners in the vehicle, each taking turns as the driver and as the observer. Driving number 15 is summary for final evaluation prior to road test, where the instructor will express his comment for final certification. In-car session 15 cannot be combined with observation sessions. 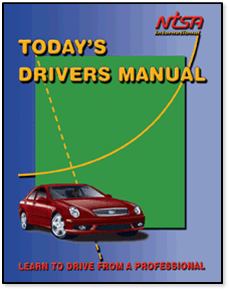 Student may practice driving in the circuit where he or she will do the road test. 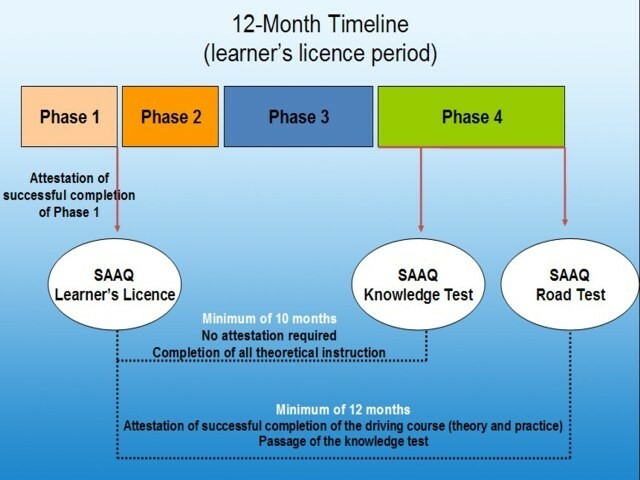 The SAAQ’s knowledge test and road test are taken at the end of the learning period at least 10 and 12 months, respectively, after a learner’s license has been obtained.